In 1920, Elsa Emerson, the youngest and blondest of three sisters, is born in idyllic Door County, Wisconsin. Her family owns the Cherry County Playhouse, and more than anything, Elsa relishes appearing onstage, where she soaks up the approval of her father and the embrace of the audience. But when tragedy strikes her family, her acting becomes more than a child's game of pretend. While still in her teens, Elsa marries and flees to Los Angeles. There she is discovered by Irving Green, one of the most powerful executives in Hollywood, who refashions her as a serious, exotic brunette and renames her Laura Lamont. Irving becomes Laura's great love; she becomes an Academy Award-winning actress - and a genuine movie star. Laura experiences all the glamour and extravagance of the heady pinnacle of stardom in the studio-system era, but ultimately her story is a timeless one of a woman try to balance career, family, and personal happiness, all while remaining true to herself. I have been intrigued by Laura Lamont's Life in Pictures ever since I spotted it at the bookstore last year. The summary sounded like something right up my alley - historical fiction, movie stars and the Golden Age of Hollywood. Y'all probably don't know this, but I love classic old movies. I used to be addicted to the Turner Classic Movies channel, and I've got an entire shelf dedicated to my classic movie collection. Audrey Hepburn, Grace Kelly, Cary Grant, Jimmy Stewart, Vivien Leigh... I could watch these stars again and again! In that vein, I'm also in love with reading biographies of famous classic movie stars. There's something so fascinating about finding out about their lives and loves behind the camera. Movie stars could stir up a scandal, even then. So, I was really excited about this book and was thrilled when Kristina offered to send me her copy. 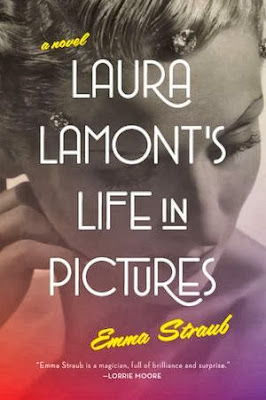 I knew that Laura Lamont was a fictional character - not a real actress from the Golden Age - but I was still hoping that Straub would recreate that classic glamour with this character and this story. Laura Lamont, born Elsa Emerson, was the youngest of three girls. Born in Wisconsin, her parent's owned and operated a playhouse that helped instill in her a love for the stage from a very early age. But tragedy strikes, and the family dynamic is never the same. So, Elsa marries and heads to Los Angeles with her husband, an actor. The marriage is her chance to get away and to leave the pain and sadness behind. She's ready to support her husband in his acting career - perfectly happy to be the lovely wife on his arm. But a powerful movie executive sees more in Elsa... He refashions her into Laura Lamont and helps launch her movie career. Sounds exciting, right? Unfortunately, this book was missing one thing that was absolutely vital for it to be a good read: an interesting leading lady. For a book and a story like this to work, Laura Lamont needs to come alive. I needed to believe that she could light up a screen, enchant audiences and have that halo of glamour that defined successful actresses in the studio-system era. Instead, Laura Lamont just limps across the page. I didn't feel like her had any spark, any pizzaz, anything to make me invested in the character's story. I had a hard time believing that someone so bland was supposed to be a small-town girl turned starlet. The book is centered around Laura Lamont, and yet I felt like she had the least character development. There's no engagement with her life - it's as if things are just happening to her (or we're being told that they are) rather than her exerting any effort or having any agency or voice. I also assumed the book would largely focus on the heyday of her career. Instead, the book is a collection of moments throughout her life. A brief introduction to Laura when she's Elsa, a glimpse into her first marriage, some reflections on her stardom and then a huge portion is dedicated to her life after her career has fizzled out. The novels ambition - to follow Laura throughout her life - felt like one of it's biggest weaknesses. I would have preferred a book that focused on a small period of time in depth rather than try to portray so much in way that just skims the surface. There's very little attention given to major historical events during those time periods, and there's also very little dialogue. It left my feeling like Laura was disconnected from reality. The lack of dialogue made it feel heavy and slow, which is shame because so many movies from that era had really quick, clever dialogue that was so smart. Just watch a scene from His Girl Friday starring Cary Grant and Rosalind Russell to see what I mean. This book had the chance to really showcase what was so great about movies created at that time while also showcasing the negatives of being an actor during the studio-system era. Straub briefly touches on what it was like to be stuck in a studio contract, with your every action controlled by executives, but it's just a minor mention in the larger story of Laura's life. I wanted so badly to like this book, so it makes me really sad that it ended up reading like a really boring biography of someone with no personality and who didn't change at all in their entire lifetime. It's an ambitious attempt that didn't live up to expectations due to cardboard characters, lack of focus, too much exposition and not enough dialogue. You want classic Hollywood scandal and glamour? I'd advise you to look elsewhere. It's a shame that a book set during a time period I find so fascinating only left me feeling incredibly detached. "That was what love was, though, wasn't it? Holding each other's misery as close as your own?" Did my comment not work? Sigh. haha. I'm sorry this one didn't work for you. I really liked it even though it wasn't what I thought it was going to be. A little slow and kind of quiet? I agree... the leading lady could have sparkled a little bit more. You know what you should try -- Starstruck by Rachel Shukert? This book sounded like it had so much potential to be a really good read! I always forget how beautiful and fascinating that particular era of Hollywood can be, and I get reminded when I watch a good film (Off topic, but any particular movies you'd recommend?) or read a book set in that time. I've been curious about this one, and was going to pick it up at the store the other day... but I hesitated. Reading your review makes me feel like I might not enjoy this one as much as I thought. Perhaps I'll borrow it from the library instead just to give it a try! I definitely say snag from library if you're curious about this one. I know Estelle enjoyed it more than me, so it might just not have been the book for me. But who knows!